DISCLAIMER: This was an accident, as in I’m not sure if I could re-create this. You may end up with fudge, you may end up with taffy, you may end up with something inedible. Line loaf pan with tin foil and grease with butter. In sauce pan combine: sugar, cream, table salt, corn syrup, and butter. Cook over medium heat, stirring while mixture comes to a boil. As soon as it reaches boiling, remove spoon and stop stirring. Let mixture boil until it reaches soft ball stage (original recipe suggests 238°F / 114.4°C. Remove from heat, do not stir. Let mixture sit until it cools to 120°F / 48.8°C, this takes between 30 and 60 minutes. 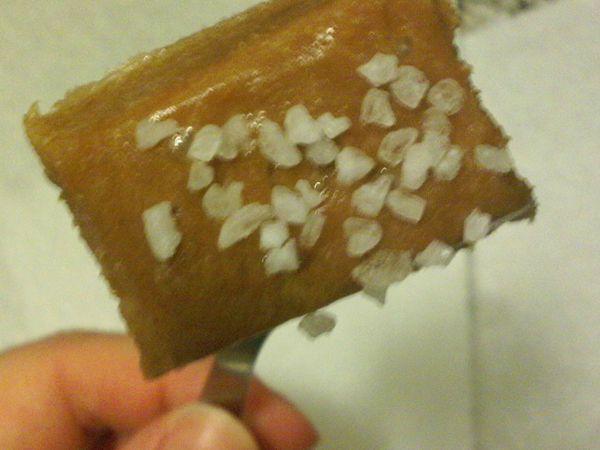 Use hot warm knife to slice pieces and press into sea salt.